Chandra National School, Aruppukottai has advertised in the Dinamalar newspaper for recruitment of Teaching Faculty- Teachers jobs vacancies. Interested and eligible job aspirants are requested to apply immediately.Check out further more details below. 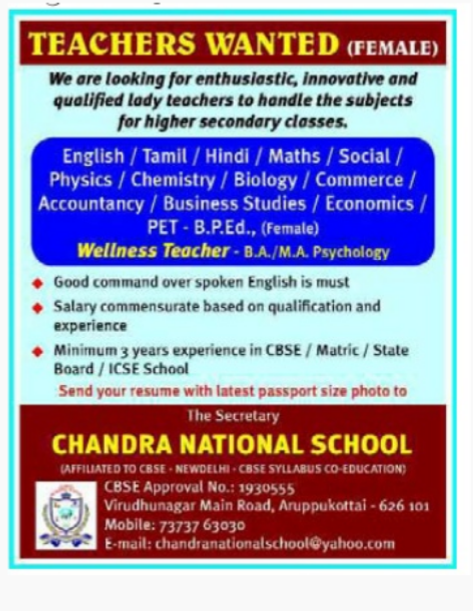 Name of the School : Chandra National School, Aruppukottai. About School: Chandra National School is a proud mission-driven community of learners, immersed in an ethos of shared beliefs, achievement, and celebration. As a parent, one of the main important decisions that you need to make resolve around is your ward’s education. Providing the Right Start at the Right Time under the Right Guidance at the Right Institution will help to develop your ward's personality which will be the key success in his/her life. CNS is dedicated to nurture responsive and motivated students through a dynamic, success-oriented education program empowering students with a global and local perspective. CNS is desirous to pursue an approach to learning; that becomes a lifelong habit. With envious zeal it endeavors to help every child develop into a holistic personality. Good command over spoken English is must. 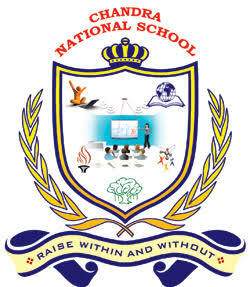 Minimum 3 years of experience in CBSE/Matric/state board/ICSE School. Salary commensurate based on qualification and experience. Reference: Recruitment Notification / Career Job Opportunities notice for Teaching Faculty - PGT TGT Jobs on Hindu newspaper Dated 3rd July 2018.